I’ve had a flu for the better part of the week, leaving me feeling far more ‘girl+snot’ than ‘girl+beer’ so it’s not been a very beery week. No point in drinking it if I can’t taste it. To kill off the last of this bug, I decided to try my hand at a Thai Pumpkin Soup from Bill Granger’s ‘Bill’s Everyday Asian’ cook book. I’ve used this book many times and it’s suitably covered in dots of sauce and oil. 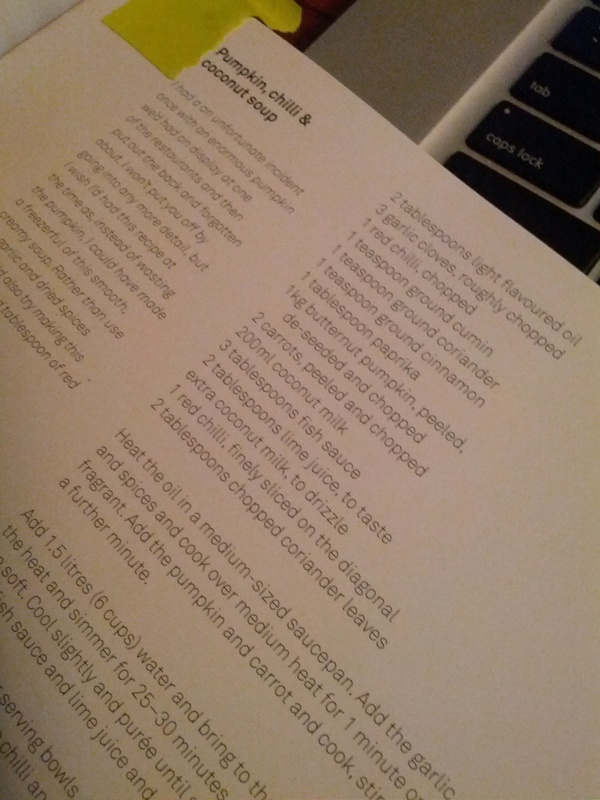 I love when my cook books look like this and it makes it easy to remember what recipes I’ve liked the most! This soup is stupidly good and pretty easy. That’s two boxes ticked! It also makes quite a fine match to a James Squire Stow Away IPA. I have to be honest, this kinda surprised me. I don’t find the Stow Away IPA particularly bitter; the bitterness is more soft than tongue-rippingly sharp but there’s a little spice and some malt sweetness in there too. 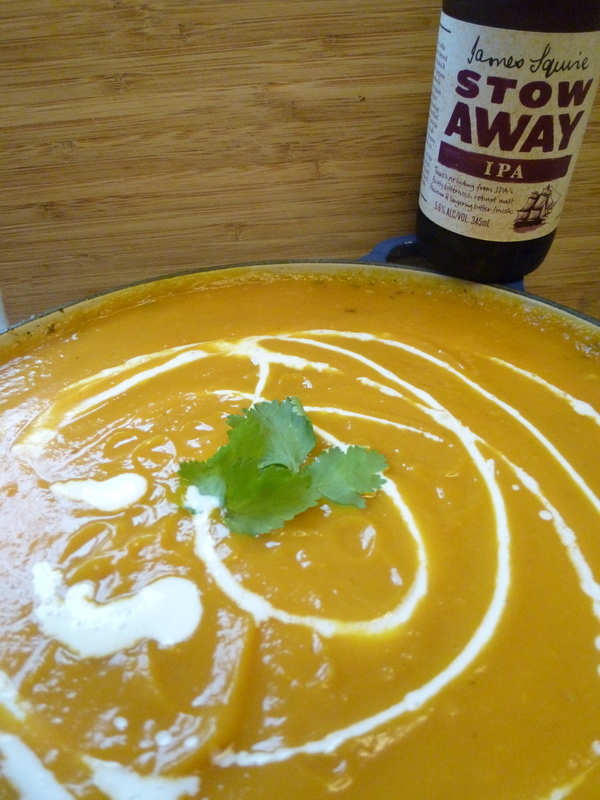 I suspect an American style IPA with far bolder bitterness would have pulverised the poor little soup into submission and perhaps this is why this particular IPA made for a good match to the soup which calls for spices such as cumin, coriander and cinnamon. As it is a Thai style soup it also required some heat so in went a couple of chillies and a nice dash of paprika. I say “dash” because the recipe calls for a teaspoon but I didn’t have any clean ones on hand so I guessed. 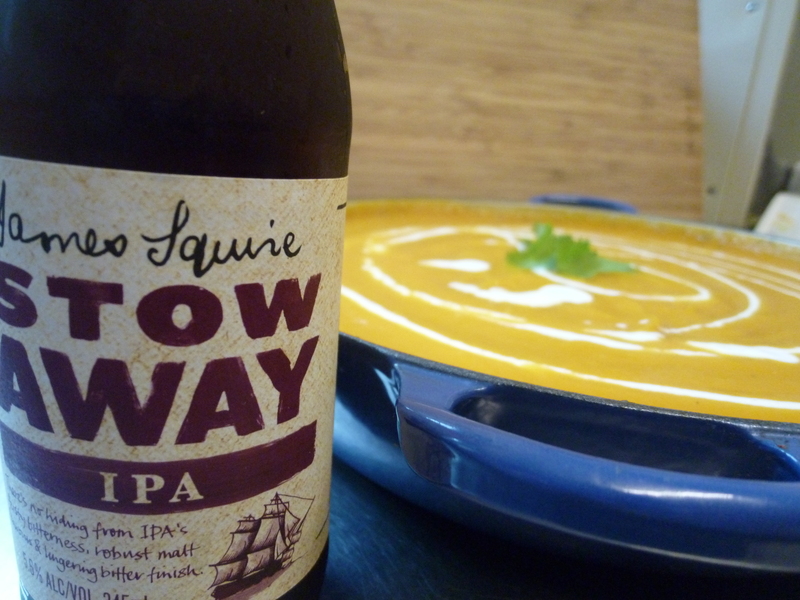 The chilli and paprika created a slight chilli heat to the soup and mirrored the slight bitterness in the beer. I’d like to be able to say this beer + food match was set up, planned and expertly executed but I’m not that clever. In reality I made the soup and my boyfriend wandered past and dropped a beer beside me thinking it might work – he’s a good man. I’m not sure what ‘serves 4’ means to Bill but I think he’s feeding some very big people!